Tony, Lula Mae, Lee and Maria with the barn in the background. Maria Santomasso Hyde is a fresh new author with a her first-ever novel published, and used to work at The Concord Tribune back in the 1980s. She recently was at the Art Walk in downtown Concord signing books on June 9th, 2017. Maria landed her job at The Concord Tribune right out of college, where she attended Appalachian State University in Boone, NC. 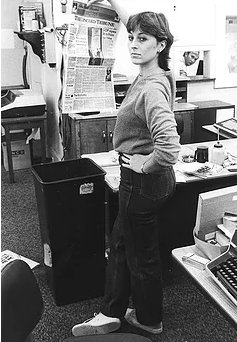 After her stint at The Concord Tribune, Maria was a public relations writer. She then entered the world of sales as a rep for college text book publisher Holt, Rinehart, and Winston/Harcourt Brace. Now, Maria owns and manages Alta Vista Gallery in Valle Crucis, NC, in the Blue Ridge Mountains, where she lives with her husband, Lee Hyde. 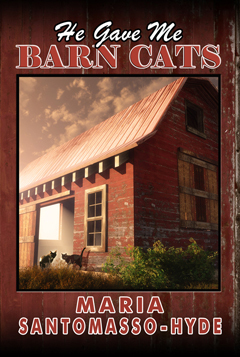 Her book, titled He Gave Me Barn Cats, released March 14, 2017, from Dancing Lemur Press. It's Maria's first book ever, and she has been thrilled to release it. Read on to read the synopsis as well as a few reviews. After many years of care-giving and too many losses too close together, Maria has a sadness bordering on darkness. When she discovers her barn is home to a mother cat and kittens, they teach her as only animals can do… but the darkness envelopes her like the fog that blankets her Blue Ridge Mountain home each morning. She creates a scorecard: God: 9, Maria: 0. Her questions turn into anger at God. Will she learn to trust again? Will the barn cats help her heal? Alta Vista Gallery is hosting a Book Launch Party on Saturday, June 24, from 11 a.m. to 5 p.m., for He Gave Me Barn Cats. The public is invited to this free event, and refreshments will be served. The gallery is located at 2839 Broadstone Road, Valle Crucis, NC -- between Mast Farm Inn and Mast Store Annex -- only 10 minutes from Boone, NC. For a map and directions to the gallery, visit www.AltaVistaGallery.com. Did you catch Maria at the Art Walk? If so, let us know in the comments!